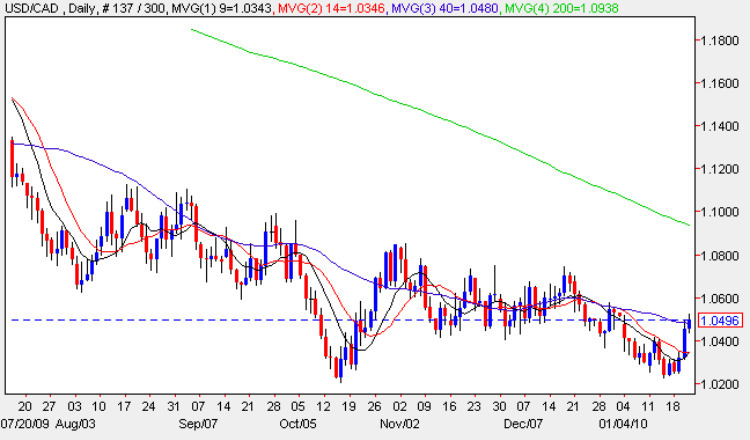 Even as the US dollar continues to strengthen against the euro it is not enjoying the same success against the Canadian dollar where it is currently struggling at the USD1.0510 price handle despite the price action having broken through the 9,14 & 40 day moving averages. One possible reason is the recent diversification by various central banks, most notably Russia whose first deputy chairman of its central bank, Alexei Ulyukayev, confirmed that it would be investing in Canadian dollar denominated deposits and bonds. “The Canadian financial market is not very deep, so we can invest in deposits in significant volumes, while the bond market is limited,” he said. Whilst the central bank did not specify how much of its reserves it was allocating to the Loonie, analysts estimate that the central bank could put up to $9bn, or 2 per cent, of its foreign exchange reserves into the currency. Russia’s foreign exchange reserves stood at $439bn at the end of Dec 2009 having grown 14% since March as rising commodity prices boosted Russia’s coffers.